Staff at Lincoln Farm where left shocked when six abandoned dogs were brought into their care recently. 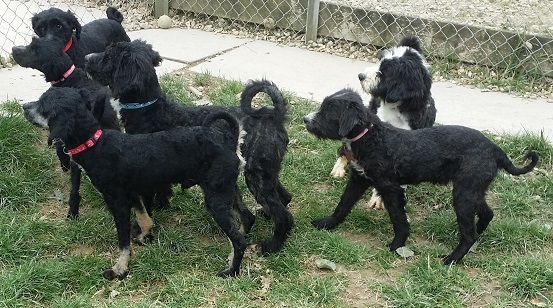 The pups, who are all aged between 6 months and 4 years old, are Poodle crosses who were found abandoned on a local farm. They were malnourished and covered in matts and dried faeces. Helen Chittock, manager at Lincoln Farm, remembered how hungry they were when they arrived: “They were ravenous when we gave them their first feed, but they have calmed down a lot and are steadily gaining weight”. Almost all the dogs, which were named Goofy, Tweety, Pluto, Taz, Bunny and Bugs, have now been placed in loving forever homes and we wish them, and their families, years of happiness together. If you feel you could give a rescue dog a home, please visit our Dog Rehoming page and contact us today.